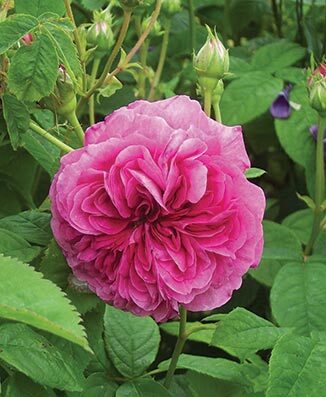 Duc de Cambridge is from the Damask rose family — the family of roses that rose oil and rose water are traditionally made from. So it will come as no surprise that this rose has a fantastic rose fragrance. We have seven of them planted near the house verandah and the idea is to be able to sit there with a glass of wine in hand and let the heady rose fragrance waft around us. The dark rose-purple blooms are packed with petals in Nov-Dec. We use the blooms to make rose petal shortbread which was popular at our last rose festival. Duc de Cambridge forms a large arching shrub and the stems grow to about 1.8m. It is well worth finding space in your garden for this spectacular shrub. It is also a fantastic cut flower which is much better than any air freshener for the home and a beautiful centre piece for the table. Forget about the bouquet of the wine — your guests wont be able to resist burying their nose in these roses. 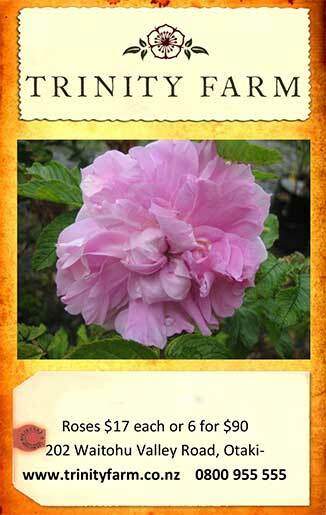 Limited stock, but a great time to plant one in the garden ready for blooming Nov-Dec this year.